Front cover and opening page of the British edition of 1944, with 171 pp. Russian culture and Slavophil tradition constitute a source of inspiration for those who have an interest in human future. 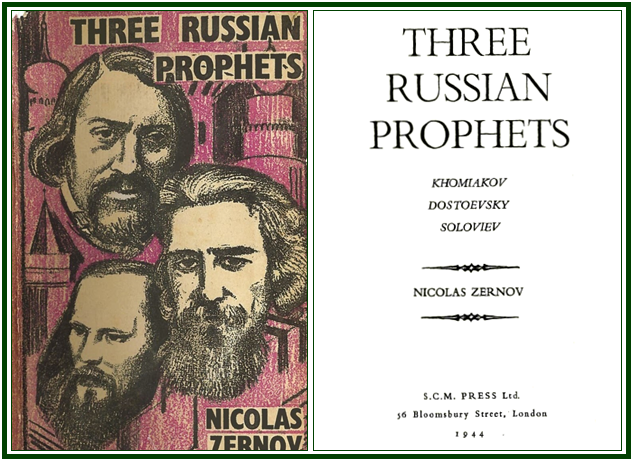 From Nikolay Fedorov to Leo Tolstoy, as from Piotr Kropotkin to Nicolas Berdyaev, not to mention the “three prophets” discussed in the present volume, Russian thinkers have been in the frontline regarding a creative and healthy view of human future, which is a key topic in the theosophy of Helena Petrovna Blavatsky. It is not difficult to see that there is a significant common ground between Slavophilism and modern esoteric philosophy. Elements of affinity will be visible to the readers of “Three Russian Prophets” in the case of Alexei Khomiakov and Feodor Dostoevsky. In the ideas of Vladimir Soloviev, however, it is not easy to find a solid ground in common with theosophy: Helena P. Blavatsky wrote an answer to his criticisms towards theosophy, and his affinities with the Vatican are well-known. In any case, it is interesting to theosophists to know some of Soloviev’s ideas. Nicolas Zernov’s book is an important tool in the building of a cultural and philosophical interaction between the “Russian Soul” and the Western part of our civilization. A natural bridge to Asia, the very “ethos” of Russia has much to say as to the future of our humanity. Read the article “Slavophilism and Theosophy”, by Carlos Cardoso Aveline. It is available at our websites. See for instance the text “Alexei Khomiakov, on Brotherhood”, which can be found in our associated websites. Her article is published in our associated websites under the title of “Answer to a Russian Philosopher”, and with the subtitle “On the Eastern Sources of Modern Theosophy”.